We don't just make it pretty, we make it clean. #1 - Shows the bathroom floor in a factory that produced plasma dust. This is as clean as the janitors could get it with mopping alone. #2 - The grime is emulsified with our initial high-pH pre-spray. #3 - The first pass with our SX-15 using 1000 psi water. What makes our Tile and Grout Cleaning so Spif-tacular? 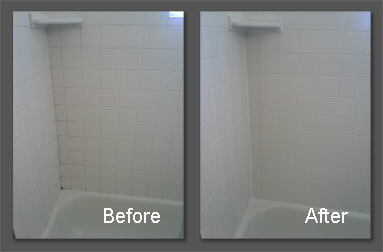 Spifco offers the most state of the art Tile and Grout cleaning system around. We harness the power of our Truck Mount Machine with a special assortment of attachment tools to make your tile, grout, or natural stone look like new again. Using 230+ degree heat at 1000 psi while simultaneously extracting the dirt back up through our powerful truckmount vacuum, Spifco can remove the most stubborn of soil, that you’ve probably been scrubbing for years, from your grout! And have your tile, stone, and grout cleaned by Reno's friendliest technicians. Or just click the big button!